Apollo 14 was the eighth manned mission in the United States Apollo program, and the third to land on the Moon. It ws launched on January 31, 1971 and concluded on February 9, 1971. 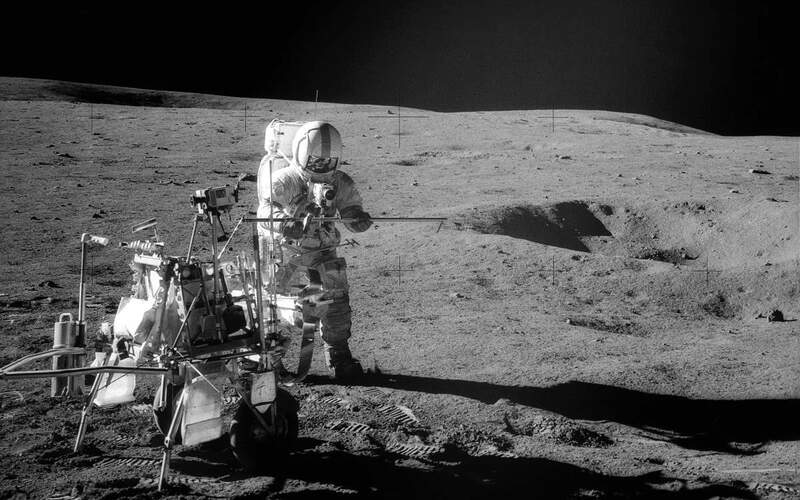 It was the last of the “H missions,” targeted landings with two-day stays on the Moon with two lunar EVAs, or moonwalks. In January 2019, scientists discovered that a rock fragment of the return samples was containing the oldest known Earth rock ever which ejected from the Earth to the Moon in a large impact event about 4.0-4.1 billion years ago. Astronaut Alan B. Shepard Jr., Apollo 14 commander, assembles a double core tube as he stands beside the rickshaw-type portable workbench or modularized equipment transporter (MET) unique to this mission. The photograph was taken by astronaut Edgar D. Mitchell, lunar module pilot, standing some 170 meters northeast of the Lunar Module (LM), during the mission’s second extravehicular activity (EVA) on Feb. 6, 1971. While astronauts Shepard and Mitchell descended in the LM “Antares” to explore the Fra Mauro region of the moon, astronaut Stuart A. Roosa, command module pilot, remained with the Command and Service Modules (CSM) “Kitty Hawk” in lunar orbit. This photo was taken on February 6, 1971. This is a cropped and resized image. You can see the original photo on the NASA Spaceflight website.